Clearly it’s been a while since I’ve had a What I Ate Wednesday post, but that doesn’t mean I haven’t been keeping tabs on some fun finds! As always, thanks to Jen from Peas and Crayons for hosting. During the rehearsal process for the show that kept me away from the blog, we had some hours-long days in the theater. Since I wasn’t really able to keep food cold and didn’t have a ton of time to sit down and eat, I had to rely on healthy, quick, nourishing snacks to get me by. Outside of rehearsal, I had very little free time, so I was also on the lookout for convenient grab-and-go foods and meals. No artificial preservatives and relatively low sodium for a packaged food. And ingredients I can recognize and pronounce! And even with sour cream as an ingredient, the whole (large) burrito still clocks in at under 500 calories! 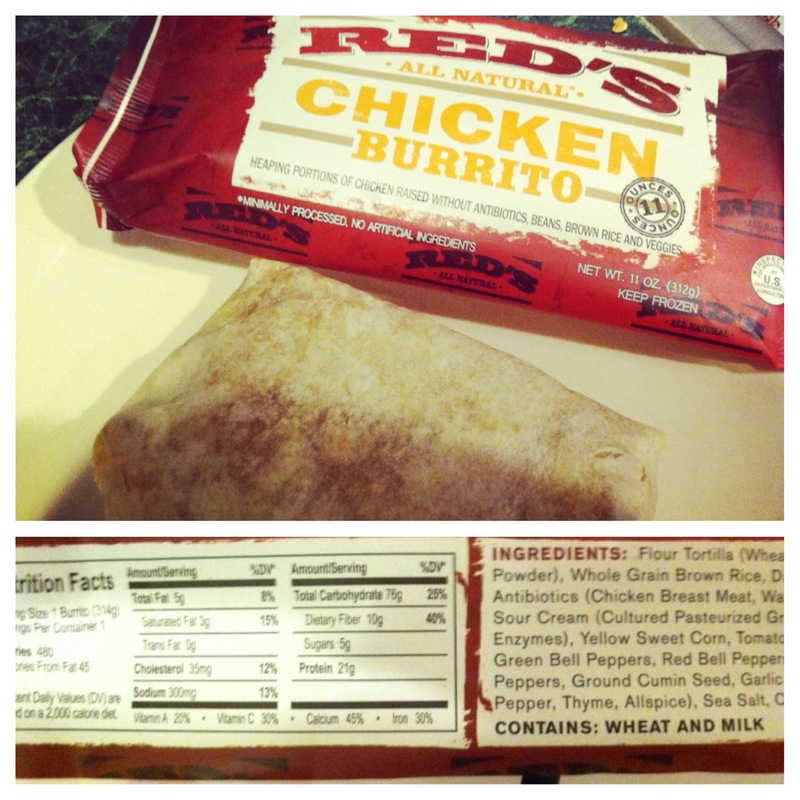 I used to buy a brand called Evol burrito, but the nutrition facts just didn’t stack up against Red’s, and the ingredient list was definitely longer and less recognizable. The best part? It actually tastes good! This time around I found healthy snacks in an unusual place–TJ Maxx! I was on line to buy shoes and, while waiting, discovered shelves of unique and nutritious snacks. 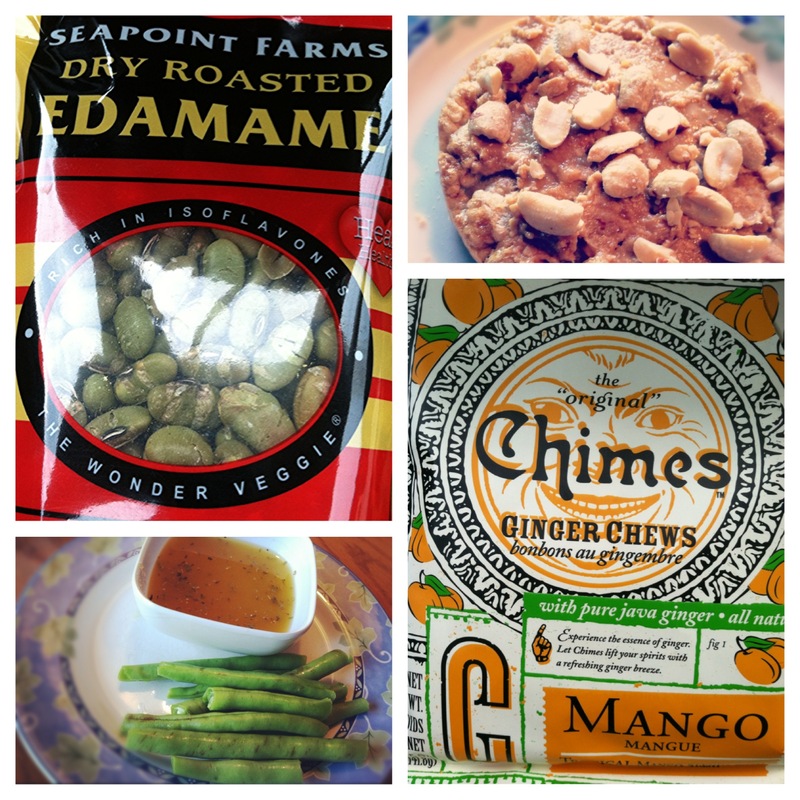 There were a lot of things to choose from, from chocolates to falafel chips, but I settled on two fun finds: dry roasted edamame and mango Chimes. I love regular steamed edamame, so I was intrigued to try it in dry, crunchy form–like soybean chips! In all honesty, they’re just okay. I can eat a small handful or two but then it gets to be too much. They’re great for an energy boost, though. As easy to eat as a bag of Goldfish crackers but packed with protein! The mango Chimes, on the other hand, were a great find. They’re small, individually-wrapped (yay!) mango-flavored ginger chews. At first, they’re sweet and candy-like with a gummy candy chewiness (which I love–like ginger gummy bears!). But after a bit, the spicy ginger kicks you in the palate. And it’s INTENSE! I’ve learned to take a few small bites instead of just popping the whole thing in my mouth. I love all things ginger, though, so this is like a gingery, fruity, guilt-free(ish) gummy candy. Awesome. A few other snack creations: a caramel popcorn cake topped with natural peanut butter and crushed peanuts for crunch–sweet, creamy, crunchy, salty. And again, protein! Okay, sometimes I drink the orange, too. You know, when I have to. But this stuff is great! It’s so refreshing, with just a hint of natural flavor. I’m bad about drinking enough water, and this definitely gets me to drink more! 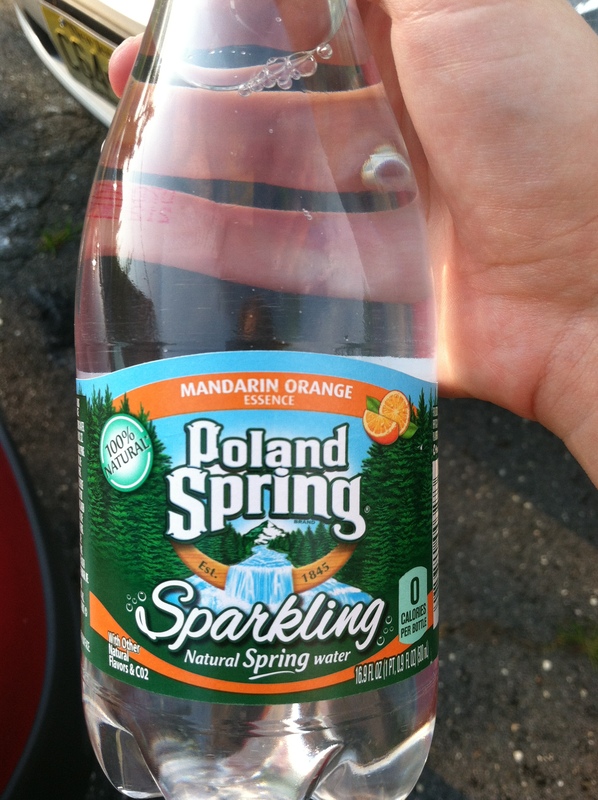 Carbonated and fruity, it’s a hydrating, sugar- and calorie-free alternative to soda. (And all natural–no artificial sweeteners or anything.) Costco sells it by the case and I’ve been drinking it like, well, water. Never heard of cranberry apple butter? What? You don’t know what you’re missing. 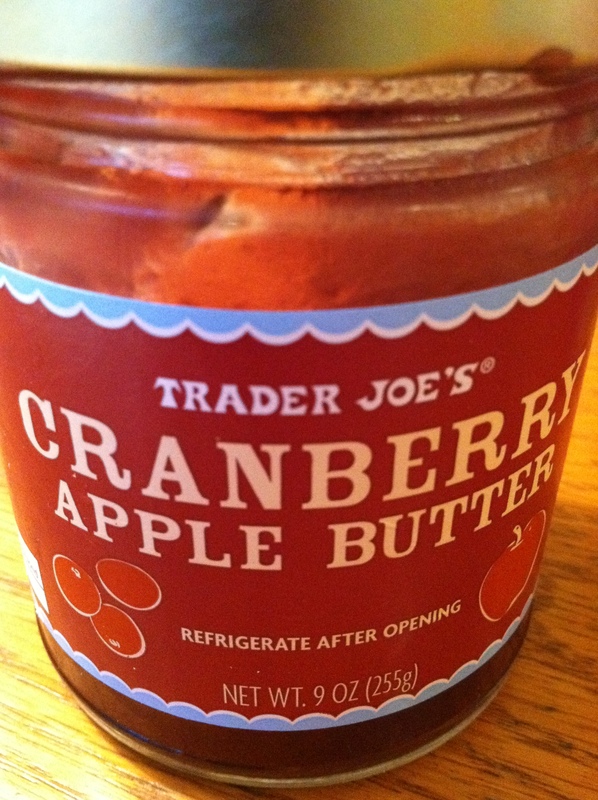 This isn’t actually butter at all, but rather a smooth cranberry fruit spread. (If you’ve ever had apple butter, think of that.) I bought it at Trader Joe’s a while back, so I don’t know if they still carry it or if it’s seasonal. Either way, if you see it, buy it! It’s super tart and tangy and is totally versatile. It goes great on toast, with or without peanut butter; in oatmeal; with cheese (especially brie or gorgonzola) and even on pork! Not a cranberry fan? Can’t find it? No problem, grab the mango one instead. You can thank me later. That being said, it’s pizza time! Happy WIAW, all! First, get some water boiling with a bit of olive oil in it. While the water boiled, I thawed out the ham. It’s even better if you have non-frozen ham. Cube the ham (I used one large ham steak) and sautee in a pan. Add frozen green beans to the pan and let it all cook together. Once the water boils, toss in as much pasta as you’d like, let cook to a nice al dente and drain. 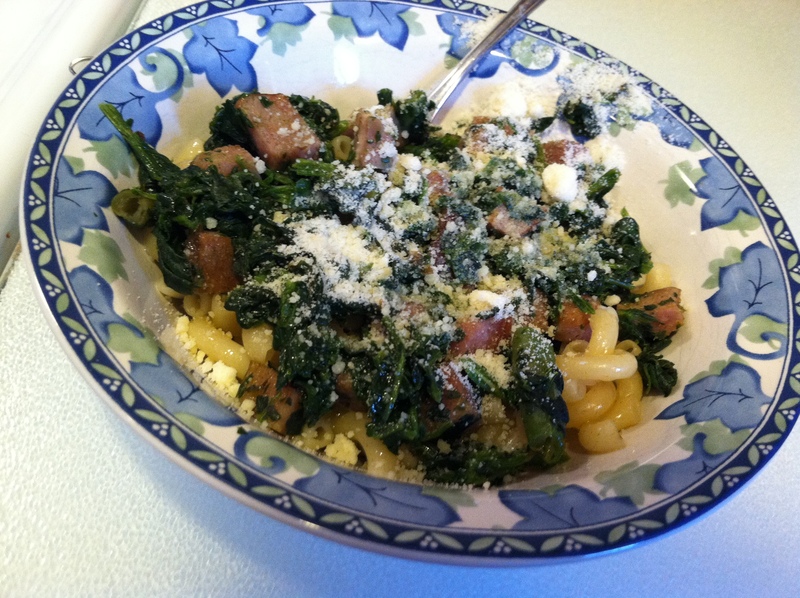 Thaw or steam the spinach and drain to get rid of the excess water (there will be a lot.) Add to the pan with the ham and green beans. Mince one small clove of garlic and add to the pan. Add plenty of fresh ground pepper and a small palmful of crushed red pepper flakes to add just a bit of heat. 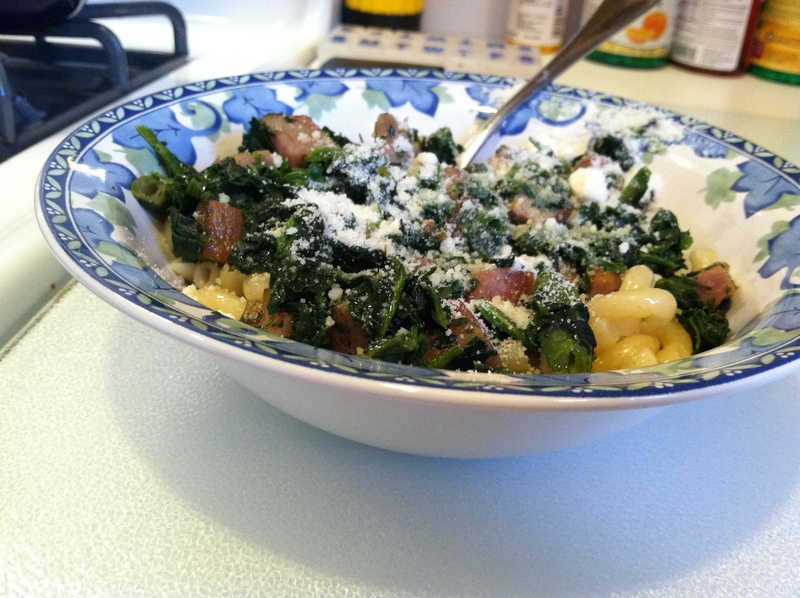 Once the spinach cooks down, add some olive oil to the pan–just a drizzle. 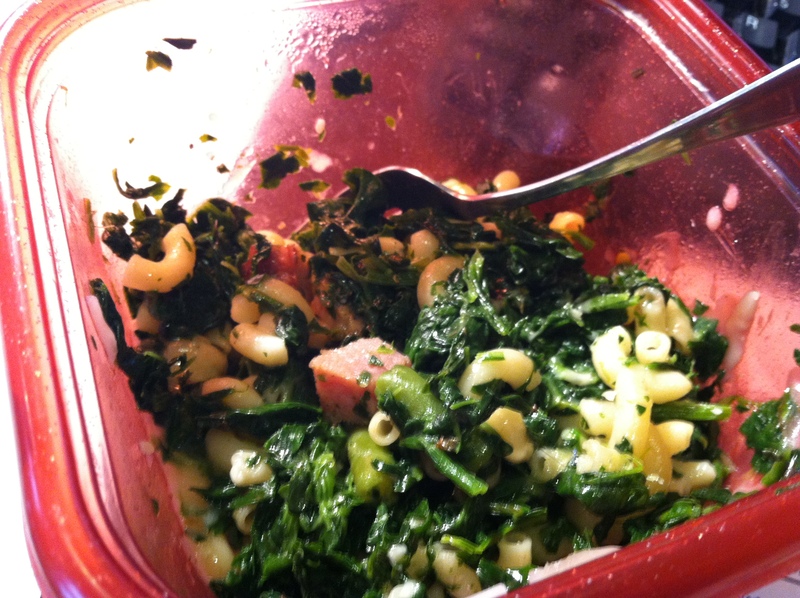 Put pasta into bowls, followed by the ham and spinach mixture. Add a generous drizzle of olive oil (mine’s closer to a pour than a drizzle) and top with the cheese. Heat in the microwave for a few seconds to melt the cheese, if necessary. 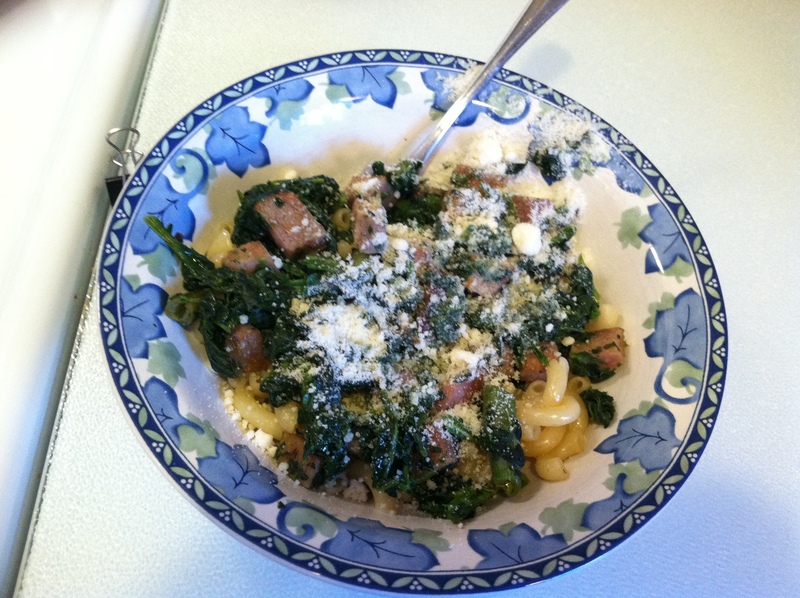 And the best part--leftovers! Made a great lunch at work the next day.